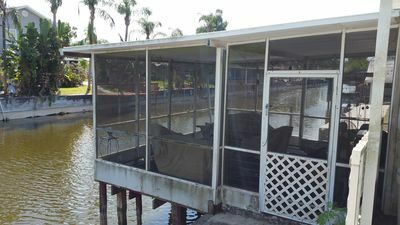 This is a 1/1, fully furnished, ground floor waterfront condo on the rim canal of Lake Okeechobee. Okeechobee is a lovely community with the friendliest people, placed nicely in the center of Florida away from the chaos of the coast. This property is peaceful & quiet. Onsite is a marina, pool & pool house, tennis courts, boat storage, & laundry facility. The unit is clean and comfortable and sleeps 4. The unit has two flat screen TVs, cable, wifi, fully stocked kitchen, and washer/dryer. Bring your bass boat, fishing poles, and tackle; this is a great place if you love fishing. Bring your tennis racquet, pool noodles, and a book; this is a great place if you love relaxation. If you want an affordable getaway and enjoy the sounds and views of nature, you will love this property. FYI: This property is perfect for the travel nurse coming in for the ?winter season too. THINGS I'D LIKE YOU TO KNOW: Rental length & pets are always negotiable, let's? have a conversation about it. This is a non-smoking unit and that is not negotiable. Your Fishing Vacation Headquarters. Plenty of parking for boats, RV's, trucks. Next to Okee-Tantie boat ramp. Covered boat parking. Your fishing headquarters. This is a single family home with 3 bedrooms and 2 baths. We often cater to the fishing community on different rental platforms, so with that being said, we are only two minutes to the Okee-Tantie free public boat ramp. A smart TV with Roku is provided in the living room, however no cable service is installed. There is wifi internet. This house is clean, well kept and fully furnished to make your stay pleasant. The house is not wheelchair accessible. There are four steps to enter and exit. This is a SMOKE FREE home, always has been, always will be. You may smoke outside on the carport, but please never in the house. There will be a $250 feel assessed if we find that someone smoked in the house during your stay. We are located just west of town in Buckhead Ridge. A two minute drive to the free Okee-Tantie and Scott Driver public boat ramps. All the shopping and restaurants, flea markets and movie theater are a mere seven minutes away. The hospital if needed is twelve minutes. The master bedroom has a king bed and it's own bathroom. Bedrooms two and three have two twin beds each. We have a queen blow up bed that can be put in the living room that extends the sleeping from 6 to 8 people, though there is an additional $50 per night per person over six people. There is nowhere on the site to list this, so it would have to be taken care of onsite. The master bath has a separate tub and shower and the quest bath has a tub/shower. Towels and linens are provided. The house is on a septic system so please refrain from flushing any sanitary napkins, diapers, depends, etc. Repairs and or plumbing service calls due to blockages caused by ignoring this specific request will be charged to you The kitchen is stocked with pots, pans, silverware, coffee maker, dishes, utensils, dish soap, microwave and toaster. Some toilet paper and paper towels are provided as well. The Ridge Market (our country style 7-11) is just around the corner serving breakfast and lunch and also offers most grocery items you may need. Sunoco gas station is also around the corner. There is a Dollar General about two miles to the west, as well as our local Moose Lodge. 25 miles further west is the Brighton Indian Reservation Casino. On your way to Downtown Okeechobee you will find Publix, Winn Dixie, Home Depot, Tractor Supply, plenty of restaurants, shopping, Walmart and the Flea Markets. We are an hour and a half from The Palm Beach International Airport as well as Ft. Myers Airport or two hours to Orlando International Airport. Three hours to Disney. There are plenty of churches in Okeechobee as well as A.A. and N.A. meetings for those in recovery We can set you up in advance for chartered fishing trips here on Lake Okeechobee for Bass or Speck/Crappie. We also work with local hunting outfitters for deer, duck and wild hog. Newly remodeled condo. Includes water,electricity, sewer, trash. And boat slip. This is fully furnished including washer/dryer and the dishes. Located on second floor. Also screened in heated pool. Minimum 30 day rental. This is located just a few minutes from shopping and restaurants. As well as two large flea markets. 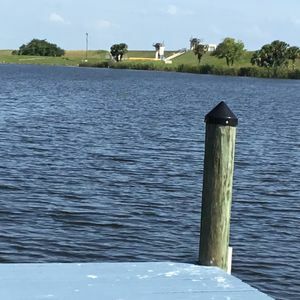 Enjoy the moderate weather either out on your boat catching monster bass or crappie, or the small town charm of Okeechobee. 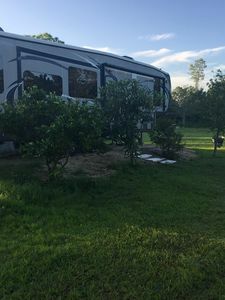 32 Foot Fifth Wheel RV with A/C, TV, WiFi, in a small gated RV Park, fully equipped kitchen, very comfortable RV, friendly RV Park, 7 Miles to a Walmart Super Store, 1.5 Miles to a well Stock Dollar General, nice quite County Park next door. Great fishing area with some of the best Bass fishing on Lake Okeechobee. 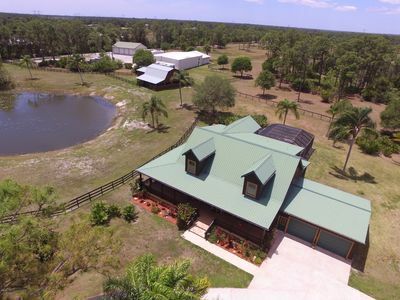 If you like the country you’ll love our quite Real Florida get away. If you have ever wanted to experience an RV this is the place to choose, you’ll love it. 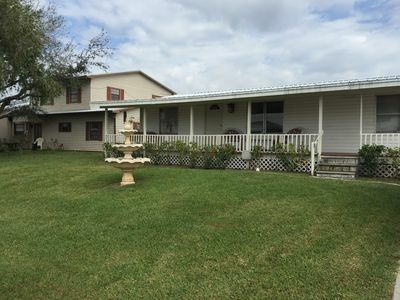 Minutes from Lake O, private boat ramp, ample parking, Family Friendly. 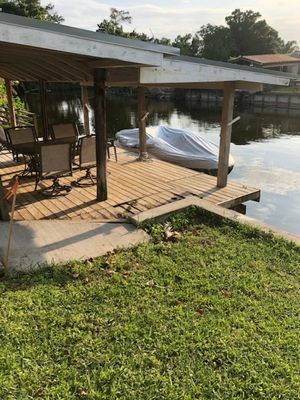 3 bedroom 2 bath home with private boat ramp and dock on rim canal. Lake access minutes away at Henry Creek lock. Two living areas, grill, ab machine, washer, dryer, internet, and cable. Card and bumper pool table, huge backyard. King Size bedroom with Tv & Cable, Queen size bed with Tv & Cable, Double size bed and Queen air mattress if needed. Two bathrooms, one with tub and shower, one with shower. Okeechobee is one of the best bass fishing spots in the world. It is also known as the Speckled Perch Capital of the world. The Speckled Perch festival is held every March. Okeechobee is the gateway to south Florida with easy access to coasts and central Florida. An hour to world class shopping in Palm Beach, 90 minutes from Orlando theme parks, and an hour away from Brighton Seminole Casino. Short drive to Spring Training in Port St. Lucie. MESSAGE FOR MONTHLY RATES. No Pets. Linens, towels, ironing board, hair dryer, refrigerator, stove/oven, microwave, coffee maker & coffee provided, toaster oven, dishes, utensils, dishwasher, pantry items: garbage bags and some condiments. Come and experience some of florida's greatest fishing and hunting. The abundance of wildlife and breathtaking scenery attracts nature watchers and sportsman from all over the world. World famous bass and speckled perch fishing. Canal is 15mins to locks which leads to lake okeechobee. 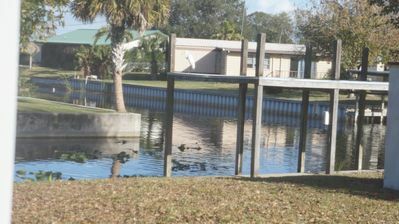 Public boat ramps 10 mins from property directly on lake okeechobee. 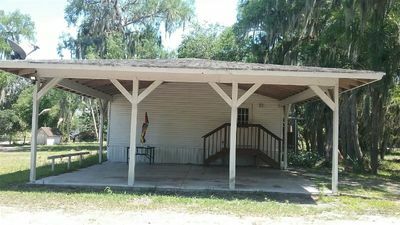 Clean and homey 2/2 w 2 covered porches, new a/c, message chair. Quiet street. Fishing And Hunting Cabin At It's Best! The barn style cabin is nestled on 3/4 of an acre with plenty of parking for trucks and boats. Close to boat ramp, gas station, bait store, restaurant bar and casino. The kitchen has everything you need to prepare meals for a large group of hungry fishermen. 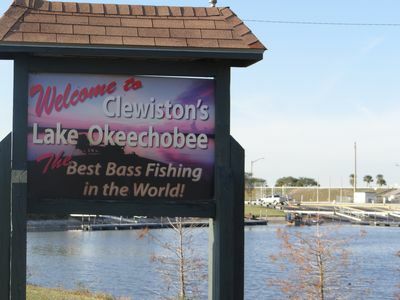 Centrally located between Clewiston and Okeechobee; perfect for the tournament angler. Large porch with charcoal grill and seating for 12. Weekly specials available...text owner for details. Fishing is GREAT at the Bass Capitol of the World! 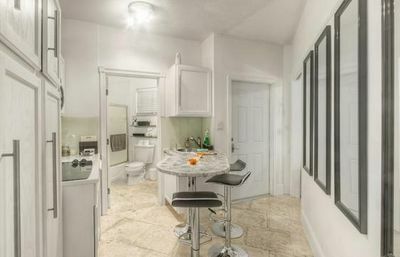 2 bedroom, 2 bath condo sleeps 4 people (plus pull-out queen bed). 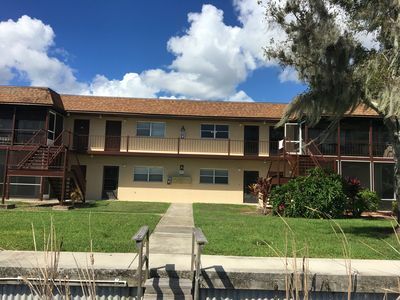 End unit with beautiful views of the lake and canal/lock from the back porch and Marina from the front. Watch the boats navigate through the lock while catching a glorious breeze. 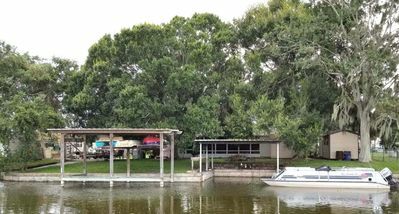 Boat ramp plus boat and trailer parking, pool and tennis courts. Extra large flat screen TV plus blue-ray DVD along with washer/dryer and fishing poles! Bass & Sun is conveniently located next to Roland Martin's Tiki Bar and Marina. No pets or smoking. Weekly, seasonal or year-round (special pricing) options available. Split floor plan. Master has a king size bed and attached bathroom the second bedroom has a King with the bathroom down the hall. Queen size sofa sleeper in the living room as well as an additional couch suitable for sleeping. Screen porch hangs out over the water. If you like to fish there are plenty of rods and tackle you are welcome to use. Bait available right down the street as well as two convenience stores and a small restaurant inside one of them. About a 15-20 minute from down town Okeechobee. The town has a Walmart, Home Depot, Golden Corral, Publix and Win Dixie grocery stores as well as several restaurants and a movie theater. Close to everything you may need but far enough away that you will not notice the bustle any where around you. I will allow your small, well-behaved, and non-aggressive dog to accompany you for your stay for a small additional fee. Peaceful relaxation. No internet or cable but a large collection of movies to watch. Additional parking next door for additional cars and boats. 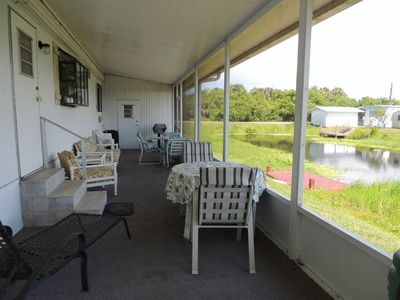 Cozy, comfortable place on a canal with a trip by boat to the locks to Lake Okeechobee that takes less than 10 minutes. Bring your own boat or kayak or rent a kayak from us. 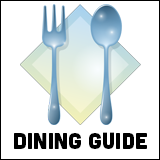 Located in the Buckhead Ridge area with easy access to loads of great restaurants. Airboat rides and tours are available less than 5 minutes down the road. Okeechobee has a lot to offer - yearly rodeo, several festivals, two big flea markets and a wonderful friendly vibe. Check-in is between 11th and 3pm. 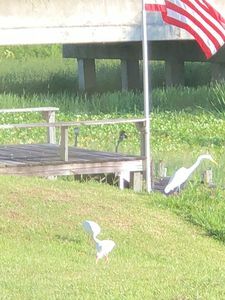 Come visit Lake Okeechobee Paradise in Lakeport Florida, steps from the Lake and some of the best fishing in the south. 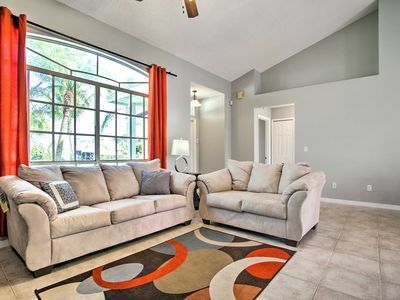 This home is spacious, comfortable, clean, and recently furnished with great amenities. Two bedroom, two bath, with 5 separate beds. King, Double, and 3 twins. 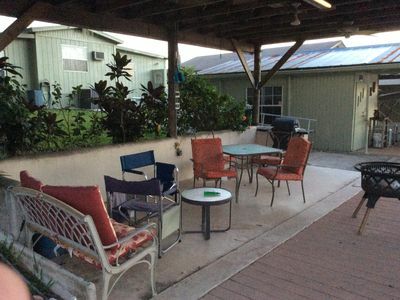 Full Kitchen, huge screened porch for cook-outs, carport, garage & large living area. 2 Satellite TVs and full amenities in the home for a wonderful stay. Home has 1400 sq feet to enjoy after a fun day on the water. 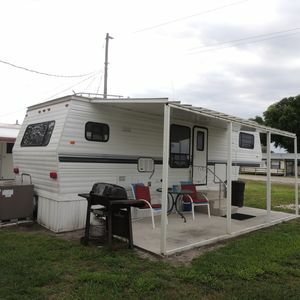 Full amenities including laundry, large kitchen, 2 boat ramps close by (Harney Pond Canal and Fish Eating Creek) and 1/2 acre of parking on property for boats and trailers. Restaurants, Bait Shop, Casino, and Fuel Close by as well!! 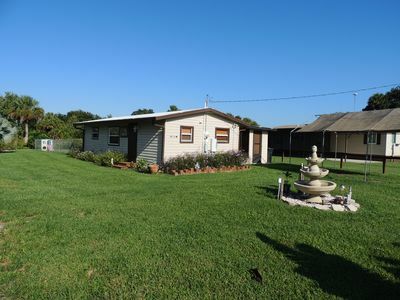 This is a 3 bedroom 2 bathroom double wide mobile home right on the water. Large covered front porch which is the length of the home. Newly renovated throughout then home. Attached enclosed sun room in the back facing the water. Bonus room (not under air) sleeps 3 extra people. Excellent place to entertain!! Large dock with covered boat slip. Kitchen is fully equipped with all that you will need to prepare meals. Central A/C, refrigerator, stove/oven, dishwasher, coffee maker, toaster, microwave, double sink, washing machine and dryer. Cable tv in living room and master bedroom. Wifi also available. Fire pit for adults. There's also a garage for storage. Property backs up to large canal in Taylor Creek. 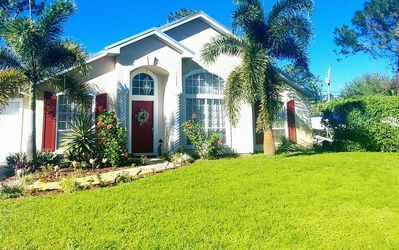 Minutes from Lake Okeechobee!! Sorry for the inconvenience but we are only looking for weekly rentals or monthly rentals at this time. 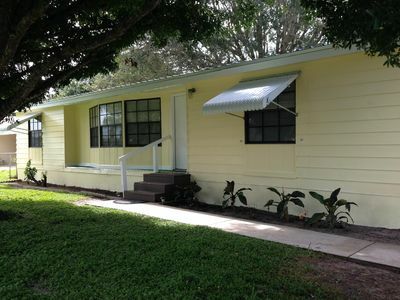 Cozy and quiet two adorable bedroom two bath mobile home with additional large waterfront Florida room. Sleeps four people. 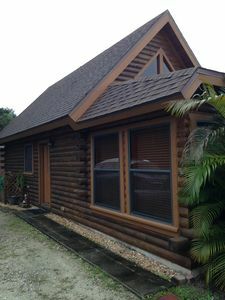 Located in Buckhead Ridge on the water with easy access to Lake Okeechobee. Covered two-car carport with ample storage for your boat or vehicles! No need to trailer your boat to the ramp everyday. Leave it in the water for a quick and worry free day of fishing! Fish cleaning station with running water and sink located right on the sea wall. Large beautiful Oak trees shade the spacious yard. The master bedroom contains a Queen Bed, full bath/shower and TV with cable. The second bedroom contains a double bed and TV/VCR. HDTV and DVD player in the living room with plenty of DVD's to chose from. All linens, towels and pillows provided. Relax on the couch in the living room and enjoy watching the boats go by. 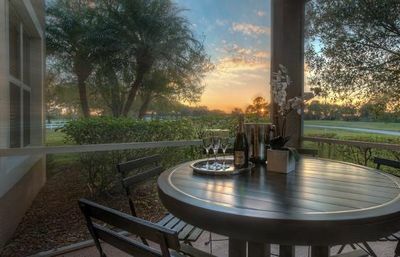 The screened front porch provides a lovely way to sit and enjoy the sunset. The home is fully furnished and the kitchen is fully stocked with everything you need to cook up your fresh catch. A charcoal grill is also provided. The Ridge Market is just around the corner serving breakfast, lunch and dinner and also offers any grocery items you may need. Sunoco gas station is also around the corner. A new Dollar General was just built about a half mile West. Only ten minutes to Downtown Okeechobee where you will find Publix, Home Depot, Tractor Supply, plenty of restaurants, shopping, Walmart and the Flea Market. Approximately 90 minutes from the Palm Beach International Airport. Perfect place for a little get away!! 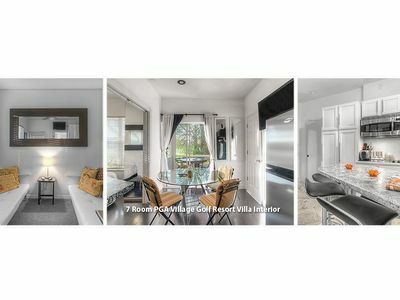 A quaint little efficiency apartment totally furnished, including linens & towels, complete kitchen with all the necessities and available washer and dryer located in the shared garage. All utilities included. This apartment does not have a living room - it is small but plenty of room for 1 or 2. It has a queen size bed, cable flat screen TV with WIFI, full bath (shower - no tub) and an awesome view of the water. 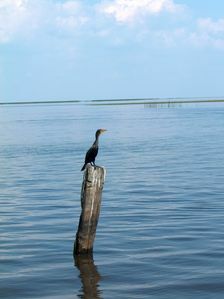 Direct access to Lake Okeechobee. Dockage available for your boat, including fish cleaning station, water and electricity. 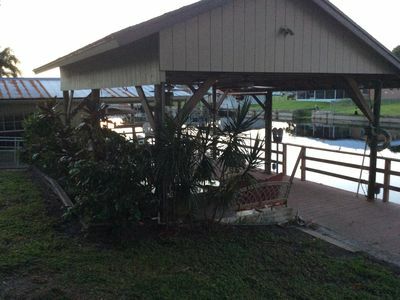 Shared covered dock for BBQ's, fishing and your enjoyment. Ideal location, convenient to shopping, restaurants, golf, etc. Quiet neighborhood. Just bring your clothes, food and fishing pole. A nice little get-a-way with all the conveniences of home. 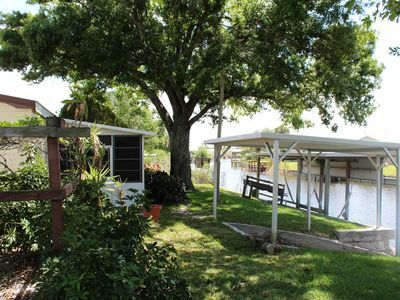 Two bedroom one bathroom home with a shared covered dock and direct access to Lake Okeechobee. Ample space to dock your boat! Fish cleaning station with water and electricity available at the dock. Home is fully furnished including all the necessities in the kitchen. Linens and towels provided. Just bring your clothes and food. Master bedroom has queen size bed and it elevates for additional comfort. 2nd bedroom has full size bed. Bathroom has shower, no tub. Dinning area seats four. Living room has flat screen cable TV with WIFI. Washer and dryer provided. Shared garage for storage is available. Ample parking for boat trailer. Close to everything - restaurants, shopping, golf courses, etc. Not too far from the east or west coast. Great place to get away from it all, especially if you like to fish or just peaceful relaxation! Attached efficiency is also available under VRBO #1158116. Newly renovated double wide trailer with large lot and private dock with Electric & Water on Taylor Creek. This beautifully decorated home has 2 bedrooms. The master has a king bed and the 2nd bedroom has a queen bed. Each bedroom has a private bathroom. There is a pull-out sofa bed and queen air mattress for plenty of sleeping options. The spacious kitchen is ideal for home-cooked meals and gatherings and opens up to the large screened-in air conditioned porch. Relax, unwind, and sip your coffee or cocktail on this large porch while enjoying the peaceful sights and sounds of nature. The porch overlooks the large backyard, canal, and vacant "nature preserve" island across the canal. This is a bird watchers paradise! Get an even closer view as you sit on the private dock, which can accommodate a small boat. The locks to enter into Lake Okeechobee are just a short drive down Taylor Creek. 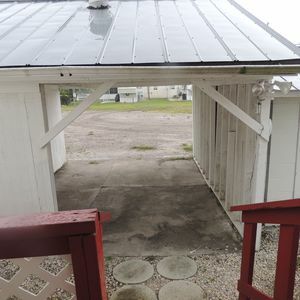 Large double driveway long enough to accommodate two vehicles with attached boat trailers. Additional parking for cars under carport. This is a 3 bedroom, 2 bathroom home (completely remodeled) set in the middle of two lots that's surrounded by many trees and wildlife. All new landscaping. Large partially covered dock great for fishing or relaxing. There is also a large screen enclosed porch for your enjoyment. Sleeps 4. One queen sized bed and two single sized beds. Very roomy kitchen and living space. Pool table! Large screen T.V. with cable and WiFi in living room. For discount info please call me before you book online. The next set of numbers will look strange but it’s my phone number and the only way the website lets me give you my number bc they want you to book online. I have discount options. Dial numbers as they flow. $561,755,002.2. 3 night Minimun please. 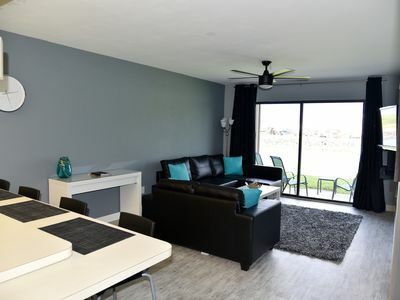 Fully furnished 2 bedroom 2 bathroom with a pull out sofa bed. 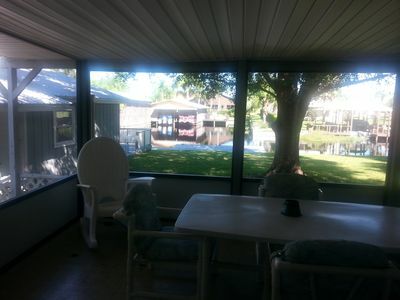 It has 2 living rooms, large kitchen overlooking the canal, Large screened in back porch with laundry room. Fenced in area for your pet ( Non-Refundable pet fee). Boat dock to park your boat. The kitchen has everything you need to cook anything from a small meal to a large Thanksgiving dinner. Dinning room sits 6 people. Master bedroom has a King sized pillow top mattress with access to your own bathroom with shower. The second bedroom has a comfy Queen mattress next to the second bathroom with a tub and shower combo. This home is very spacious. 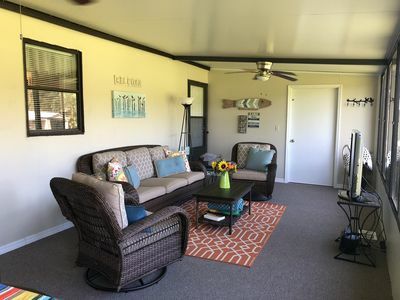 The Kissimmee River Lodge is a tastefully furnished three bedroom two bath double wide mobile home located on the Kissimmee River just minutes from Lake Okeechobee. It will sleep up to 7 people -it has a queen pillow top in the master bedroom- a queen pillow top in the guest bedroom- a queen hide a bed sofa in the living room and a twin in the third bedroom. Relax after a day of fishing or hunting in the living room that has two recliners and 42" flat screen TV. Dish satellite TV service is provided you get every channel Dish TV offers including two movie channels and all the local channels and sports package. The Kitchen is fully equipped with electric stove and self cleaning oven, microwave, refrigerator with ice maker, blender, mixer, crock pot, coffee maker, toaster, stainless steel pots and pans, and service for 8 in dishes and silverware. It has everything you need to prepare a small snack to a full Thanks Giving Dinner. Each bathroom has six Bath towels, six hand towels and six face clothes. Linens are also provided with two sets of sheets for each bed. 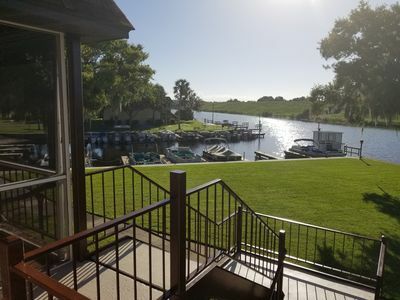 When staying at the Kissimmee River Lodge at River Bluff Fishing Resort all you need to bring is you personal Items and Fishing Pole we provide everything else. 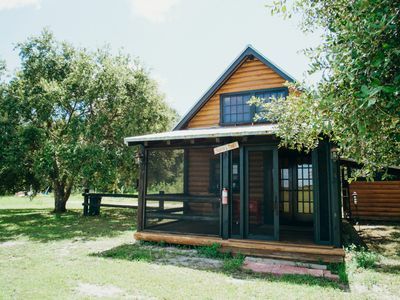 Paradise Ranch at "The Sweetest Town In America"
A charming, rustic cabin with 12-foot ceilings; get the "log cabin" experience with all of the modern amenities such as a screened-in porch with ceiling fan. Other amenities include a kitchen, a bathroom, a television and a large DVD collection for those rainy afternoons. Walk the nature trails, or relax by the public pool under one of our tiki huts. Fire pit available for evening marshmallow roasts. 2.5 acres Farm with a manufacture home 2/1 with two beautiful screened porches in front and back of the house, very cozy place. Outside there is a small house With one double bed and one twin bed with new AC. We also have a large green area for tents camping.Outdoor full bath, including a shower, toilet, and sink. Furthermore, you will find full RV hookups. The encampment also serves as farmland, so any and all pets are more than welcome. 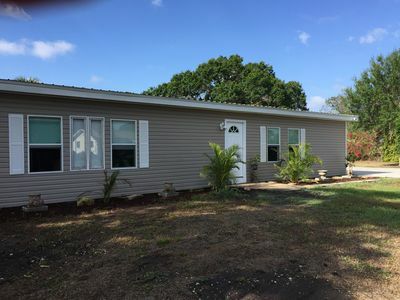 Conveniently located near the largest freshwater lake in the state of Florida, this private, 2.5 acre encampment will provide you with the disconnect you've been looking for. 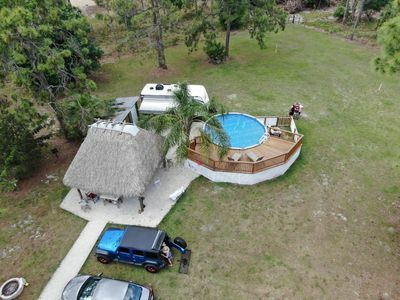 This site offers a refreshing dip with an above ground pool, a shaded, large Tiki Hut, perfect for barbecues, and two relaxing hammocks, for when you just need to take it all in. The campsite is uniquely equipped with an outdoor full bath, including a shower, toilet, and sink. Furthermore, you will find full RV hookups are available (50 amps, 30 amps, 20 amps, water source. The encampment also serves as farmland, so any and all pets are more than welcome. For the ATV enthusiast, bring your ATVs out to out site, as there are plenty of trails, perfect for exploring. YES YOU CAN RENT THIS OVER 7000 SQ FT LOG HOME MINI MANSION IS ABSOLUTELY BEAUTIFUL WITH POOL AND VIEW ON LAKE. BIG PORCH SCREENED WITH BBQ CHAIRS BUILT WITH THE FINEST HIGH QUALITY CEDAR WOOD SITTING ON A 43 ACRE SPRAWLING PLANTATION. NO SHARE HOUSE, ALL FOR YOURSELF... COME ENJOY , YOU WILL NOT REGRET THIS PEACEFUL GREAT GATEWAY PARADISE. 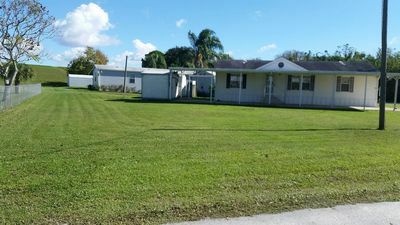 PROPERTY IS GATED , IT IS SAFE TAKING WALK AROUND...15 MIN from 95 AND ALL SERVICES PAVE ROAD ALL AWAY BARELY 30 MINUTES FROM THE BEACH, THIS IS THE PERFECT PLACE FOR YOUR VACATIONS.LOCATED IN THE HEART OF PORT SAINT LUCIE, PURE COUNTRY LIVING BUT CLOSE TO THE CITY. 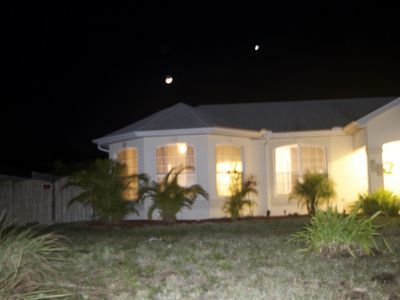 ALL FURNISHED -NICE KITCHEN LOCATED BETWEEN WELLINGTON AND VERO BEACH POLO FARMS. PLEASE CONTACT OWNER FOR DATES LESS THAN 7 DAYS FOR MORE INFORMATION. FOR 1 MONTH RENTAL PRICE IS NEGOTIABLE PLEASE CONTACT OWNER. Relax in the beautiful backyard with a drink, while family and friends prepare dinner on the grill. 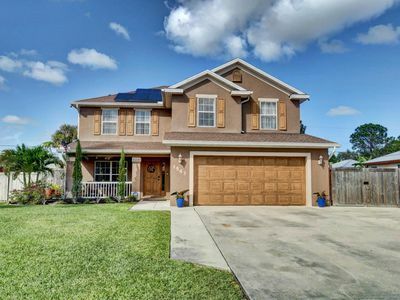 This beautifully decorated 5BR, 3 1/2 Bath home sits right in the middle of Florida and is close to everything (First Data Field, beach, local restaurants, etc...). Private fenced back yard with large pool. This home sleeps 10 comfortably. Linens, towels etc... are provided. Newly remodeled kitchen, appliances and granite counter tops. This is a MUST see for an amazing vacation, while staying in Florida state with family and friends. Astonishingly Enchanting! Casa Del Sol!! Beach, Golf, Shopping and more! Touched with elegance, yet, charming, very private, roomy and with comfort!. This tastefully decorated, fully furnished consists of 4 rooms, 3 bathrooms, 2 very big living room, 1 equipped kitchen, 1 dining room and a big warmed private swimming pool and spa. At 2 hours of Orlando, Disney or Miami; and in 20 minutes of the beach ! You are minutes from beautiful Jensen Beach, Bathtub Reef and many others. Shopping is around every corner; from Tradition, to the Treasure Coast Mall to the wonderful shops of the Stuart historic district. Are you a sports fan? Within minutes you could be watching the Mets or Cardinals during spring training. If golf is your thing, there are over 20 courses near by ranging from upscale to very affordable. Like to fish? We have many wonderful charters to get you hooked. Also you are very near 6 public tennis courts. The home offers all the comforts of home. Amenities include free internet access, cable, comfortable seating and sleeping, including a fully stocked kitchen with small appliances and household products. NEW! 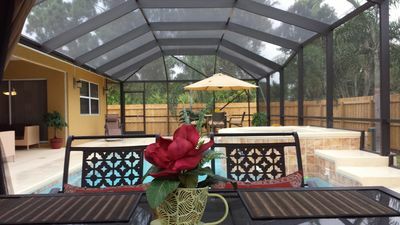 Beautiful Port St. Lucie Home w/ Pool Table! 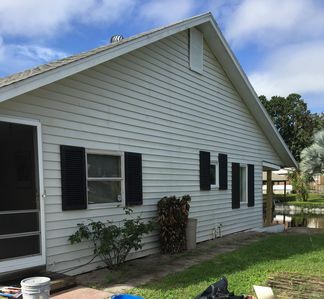 3 br 2 ba,Solar & Electric Heated Pool, Close to Beaches & Golf, Great Location! 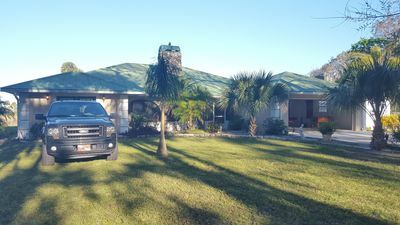 Welcome to our home in Port St. Lucie Florida! Our home is located in a quiet, family friendly neighborhood. 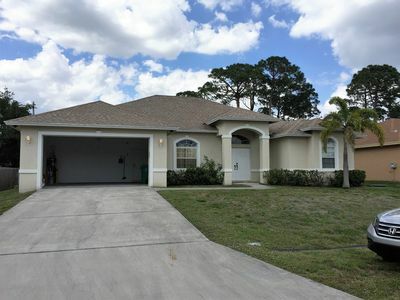 It is centrally located with easy access to Port St Lucie Blvd, the Turnpike, and I-95. The closest airport is the West Palm Beach airport, it is only a 50 minute drive from the property. 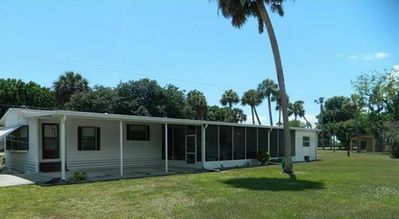 We are a 20 to 25 minute drive to the beautiful Ocean Drive at Jensen Beach. This beautiful scenic road gives you access to the beaches on the coastline nestled between Hutchinson Island, Fort Pierce and Stuart. There are twenty one miles of beautiful coastline you are sure to enjoy! We have many attractions and leisurely activities for you and your family to enjoy during your stay. If you are an avid baseball fan, you will want to catch a game at Tradition Field located 10 minutes from our property. There you will have the opportunity to watch the NY Mets play at their very own training camp. 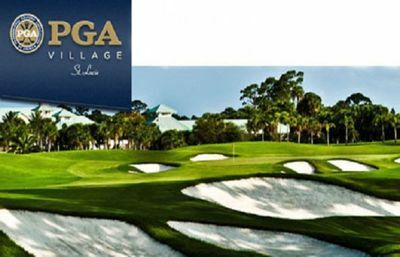 If golf is your game, you can play at any of the Nationally renowned PGA Golf Courses, or at any of the public golf courses Port St Lucie has to offer. If you'd rather go fishing, you have come to right place! You can choose from a variety of different options like Shoreline fishing, Deep Sea fishing, or even Pier Fishing. 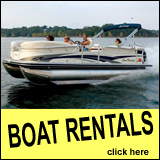 Charter Boats depart daily from the Fort Pierce Inlet and Stuart, FL. My all time favorite activity is simply reading a good book at the beach, while listening to the sounds of the ocean. Whatever you choose to do, there is something for everyone. We have many restaurants and shopping plazas to choose from. The closest is less than 1 mile away. It includes a full service supermarket several restaurants and a gas station. You will never have to travel far to pick up supplies. Our home has been tastefully decorated. The furnishings are all new, and were chosen with comfort in mind. The style, to allow for a feeling of openness. The layout of the home lends itself for entertaining, or simply to unwind, and relax. It is peaceful, and filled with natural bright light. The Pool/Outdoor dining area is One of our best features, The patio dinning table seats 6. Nice comfortable hammock for relaxation in the sun. We have a propane outdoor grill on its own outdoor deck! For great barbecue. The dinning room has retractable glass sliding doors that open into the pool and outdoor dining area. The kitchen has glass sliding windows that overlook the pool and patio entertaining space. This allows for the rays of the sun and the tropical breeze to enter the house. The kitchen comes fully equipped with new stainless steel appliances; stove, dishwasher, microwave, and a double door refrigerator with an ice maker. It also comes with a filtered water dispenser. The kitchen is also equipped with small appliances, and dinnerware for your everyday cooking and entertaining needs. We have also supplied the kitchen with bakeware in case you and the kids can't do without the homemade cookies! The dinning room table seats 6, with additional seating for 2 at the breakfast bar. The living room is very spacious, equipped with a large sectional, for plenty of seating. 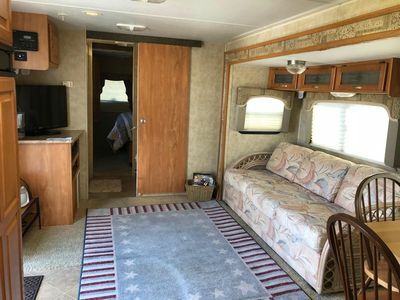 Also equipped with a Flat screen TV, DVD/Blue Ray/Bluetooth stereo system, with connection capability to Netflix, WIFI, Pandora and You Tube. The Master bedroom has a queen size bed with an orthopedic, and padded mattress for a restful and comfortable nights sleep. It has a mirror and dresser so you can unpack, and feel right at home. The Master bathroom is spacious and has been recently remodeled with a tiled shower. This Master bedroom sleeps 2. The second bedroom has a Queen size bed, also with a pillowtop mattress, which sleeps 2. The third bedroom has a full size bed, and a twin bed. The Third bedroom is equipped with a flat screened TV for the enjoyment of the children. This bedroom sleeps 3. All bedrooms have spacious walk in closets with baskets and drawers for storage. The second bathroom is the Cabana bath, which leads directly into the pool area for your convenience. It has been completely remodeled. We offer a walk in laundry room equipped with a washer and dryer. Also equipped with Iron and ironing board. The property has fenced yard for your privacy and comes with a home security system. Home has a new central air and heating system. We hope you & your family enjoy your stay in our home. Come back Soon! 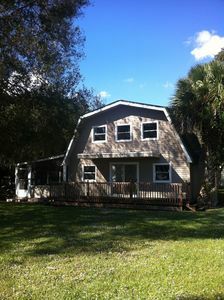 This is a newly renovated, beautiful vacation home for the whole family, or you and your friends. It is a 2/2 that sleeps up to 6 comfortably. The centerpiece is a three seasons room that opens on all sides, adding an extra spacious feeling to the whole place. 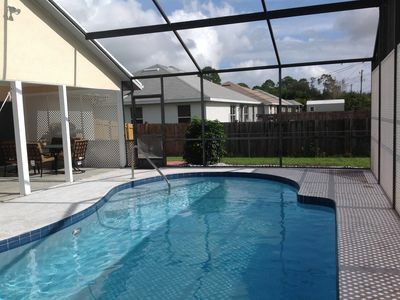 Also included is a newly installed, state-of-the-art, which is perfect for a getaway in the Florida weather! Very family-oriented neighborhood, friendly neighbors, this home is surrounded on the backyard side by a green belt of preserved forest with enough space to take a walk through, or to ride four-wheelers in! Gorgeous in the day time! 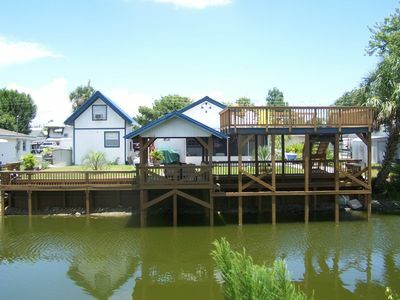 The home has an extended carport, perfect for bringing your boat along for the fishing, or for multiple cars to park. This neighborhood is just off the beaten path, in the perfect place between suburbia and the countryside. 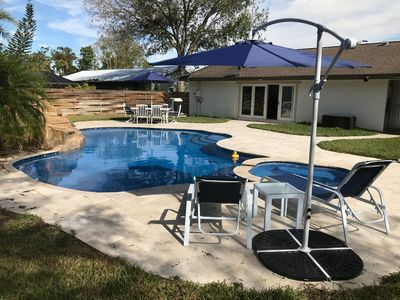 Located in-between Ft. Myers and Lake Okeechobee, and just a short drive to the gulf coast, opening a wide range of activities, including skydiving, hang-gliding, plenty of fishing, air boat rides, and nature parks.